Thought i'd start a thread to give people the heads up on Camaros for sale around the place. this guy bought the car late last year for 39k, i know i was looking at it. That was when it was on carpoint yeah? Seems to be a lot of people around the place that can't afford to have 'toys', i wonder if this is the case with this one. Seems like a good buy for what it is. yeah thats the car, it was advertised for 49,990 for AGES, then dropped to 39k and was sold within a couple of weeks. Ha!! So was I. In fact I missed it by minutes. The buyer turned up at the owner (Justin)'s place in QLD whille I was arranging a deposit in Vic... Justin rang to let 'me' know & confirm my interest, but accidentally rang the wrong person (who of course didn't want it) and the new guy drove off in her. I was gutted, but ended up getting my 67 beast through Justin anyway (a mate had under a cover for 2 yrs with no motor), formed a brilliant friendship & now have a 'project' car rather than a 'already-finished-dream' car :D Which is fine by me & can build MY way :p Bloody nice unit though. Trick bits everywhere. I was also looking at this car .. but was out of the country at the time , I heard it sold for $35K .. last year . 69 Camaro Pro Street . This thing has been for sale for so.. long i cant tell if it is for real, or if it is a scam ? 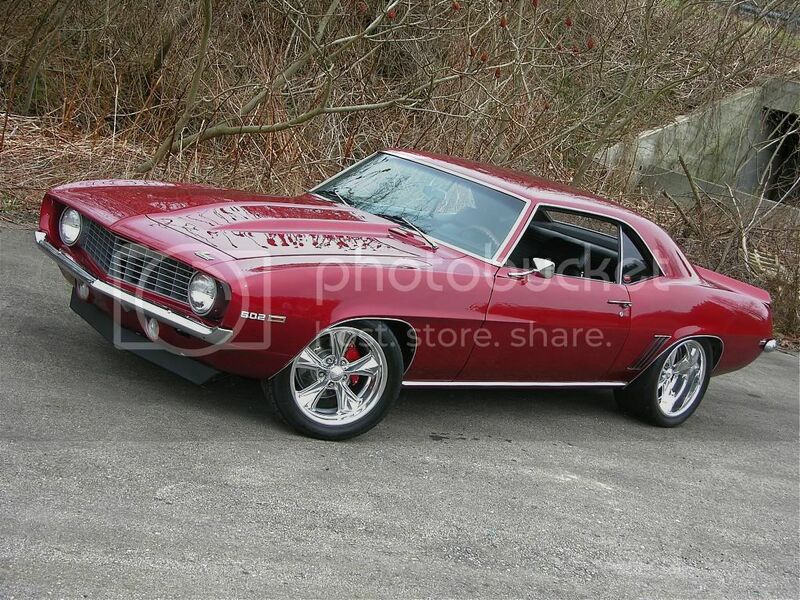 1969 Pro Touring Camaro with attitude! This car has everything you would expect it to have. Starting with the motor, it is a stout 496 Cubic Inch Big Block Chevy stoker motor with aluminum heads. The transmission is a built TCI Performance 350 Turbo shifting the gears and a line lock for your launching needs. The suspension is a complete Detriot Speed and Engineering (DSE) from front to back. It sports the quadralink rear system with a 9 inch ford turning 4.11 gears. With coil-overs on all four cornes, the large front sway bar give you unbelievable cornering. With the big disc brakes, the stopping power is aggressive for your performance needs. The wheels are Foose Design Nitro 18 x 10 rear (DSE Mini Tubs) and 17 x 8 fronts wrapped with Nitto 555 fronts and 555R in the rear. The paint is a breath taking Red / Burgandy with ghost flames that suprise you when you find them. Between the great stance and unbelievable sound, you will not enter any show without being seen. This car is the perfect example of Pro Touring from the ground pounding motor to the road race suspension. With this Camaro, you will be ready to take on any modern day sportscar. Cost to build new exceeds $80,000!